The wives of Crimean Tatar political prisoners, detained on November 8 at the administrative border with the occupied Crimea, told the details of their detention. The security forces asked them about their involvement in the terrorist organization ISIS. “During the interrogation, I said that I will not talk to them without a lawyer and on the basis of Article 51 I will not talk to them at all. He began to exert pressure on me, wrote down the numbers of my parents. I was asked about my husband, whether he bears a beard, whether he was going to Syria, whether he is connected with ISIS, and whether I was going to ISIS, if I know what is ISIS, if I have any extremist literature at home,” said Abullaeva - the wife of the arrested figurant of the "Hizb ut-Tahrir case " Teimur Abullayev. Fera Abdullaeva, the wife of the figurant of the "Hizb ut-Tahrir case" Uzeir Abdullayev, added that when they were detained, a paddy wagon with the soldiers was immediately called. 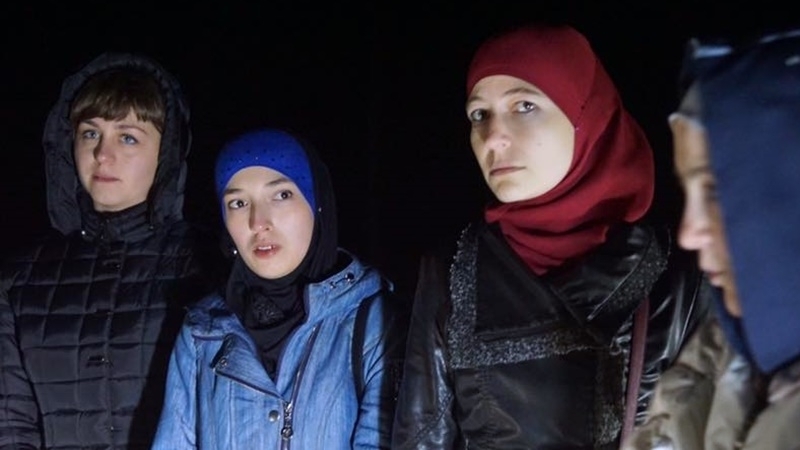 Fatma Ismailova, the spouse of the arrested figurant of the "Hizb ut-Tahrir case", noted that all women were overtaken by fear and threatened with physical force. Human rights activist Edem Sememlyaev informed that "law enforcement officers" tried to persuade him that all the women were voluntarily on that check. A group of Crimean Tatars from Dzhankoy was heading to support the women held at the administrative border with the occupied Crimea. They were detained as well at the entrance to Perekop, and released at about 2:00 am November 9. Earlier, QHA reported that on November 8 at about 7:00 pm on the administrative border between the mainland Ukraine and the occupied Crimea, the Russian border guards detained seven Crimean Tatars women, wives and close ones of the political prisoners without explaining any reasons. Among the detained were: Liana Bilyalova, Fera Abdullaeva, Guzal Salidinova, Alim Abdullaeva, Fatma Ismailova, Meriem Kuku, Zarina Dzepparova. The women were detained for more than 6 hours at the Russian checkpoint "Armyansk-Chaplyanka". At about 11:00 pm, the lawyer Eden Sememlyaev was allowed to the checkpoint. Around 11:45 all the detained women were released. The goal of the Russian security forces' actions in the occupied Crimea is an attempt to make the Crimean Tatar people look as terrorists and extremists. They are also aimed at repression and intimidation of the Crimean Tatars.